In addition, Metro will be working on the Red Line tracks between Friendship Heights and Medical Center to replace track fasteners, and between Takoma and Glen Forest to improve train control rooms. Single-tracking in both those situations will add 20 minutes per trip in delays. • Blue Line Shuttle: Stadium-Armory to Benning Road. This bus shuttle will operate between the Stadium-Armory and Benning Road Metrorail stations. Customers using this shuttle bus should add 15 to 20 minutes to their trips. • Orange Line Express Shuttle: Stadium-Armory to New Carrollton. This express shuttle bus will operate between the Stadium-Armory and New Carrollton Metrorail stations with no stops in between. Customers using this express shuttle should add 30 minutes to their trips. • Orange Line Local Shuttle: Stadium-Armory to New Carrollton. 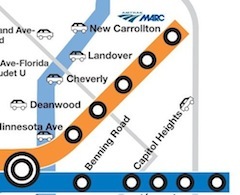 This local shuttle bus will operate between the Stadium-Armory and New Carrollton Metrorail stations and will stop at the Minnesota Avenue, Deanwood, Cheverly, Landover and New Carrollton Metrorail stations. Customers catching this local shuttle should add 40 minutes to their trips.